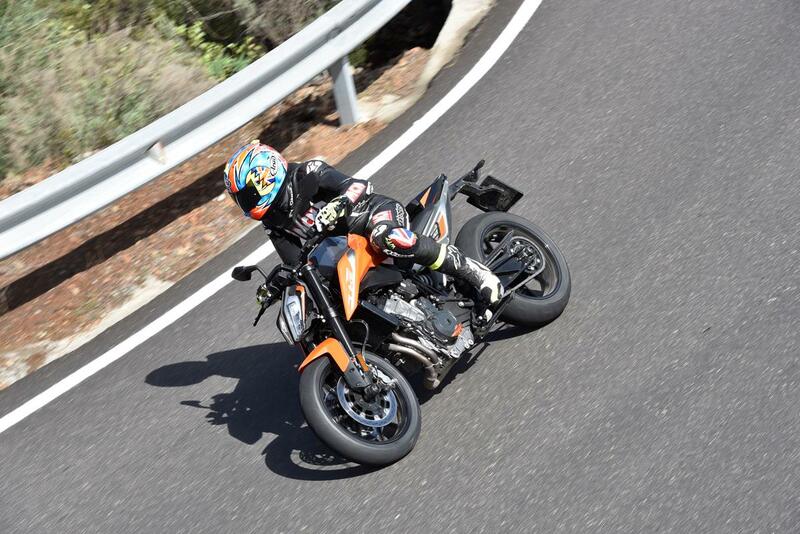 KTM have got it so right with its new 790 Duke. Just like the cream of the middleweight naked crop it combines calm practicality with playful excitement. It can be a track tool one day and a commuter the next. Its new LC8c engine is a peach, the chassis predictably balanced and it’s all topped off with superbike-spec electronics. After 24 years of the KTM, why didn’t they think of this before? A new tubular steel dual backbone frame is shrink-wrapped around the new engine, so there’s not an ounce of flab. 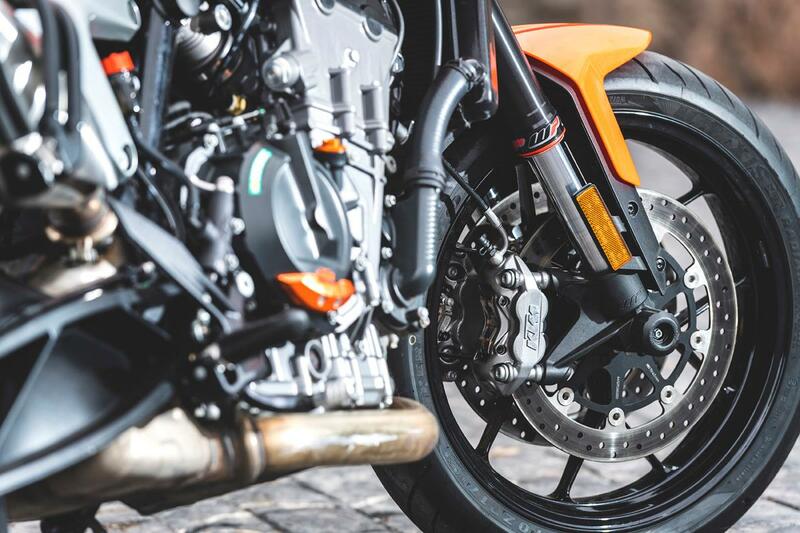 The 790 Duke is as muscular as a pit-bull and weighing just 169kg dry, weighs about as much as its dinner. 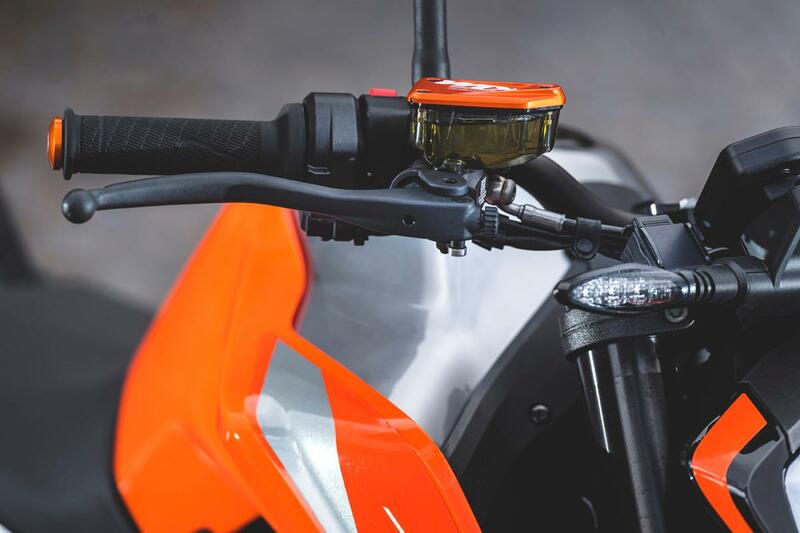 With its narrow hips, small riders will find the KTM easy to get on and plant feet down, even with a 825mm high seat (there’s also a 805mm accessory seat and 780mm lowering kit). There’s loads of legroom for six-footers, too. The bar position is natural in its standard position and its bath time-comfy, even after a day’s riding. But as you’d expect from such an unashamed, exposed naked, wind protection is non-existent and your neck feels every mile an hour. 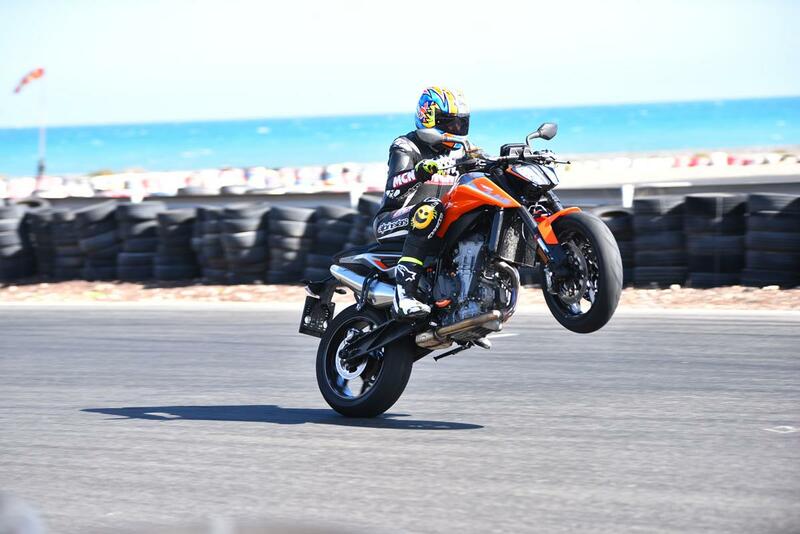 As KTM’s nickname for the 790 Duke suggests, you can go nuts on ‘The Scalpel’. It happily slices through tight twists on the road and will hold its own on a small track, like Brands, Cadwell or Mallory. The chassis is balanced, stable, predictable and the brakes consistently strong. 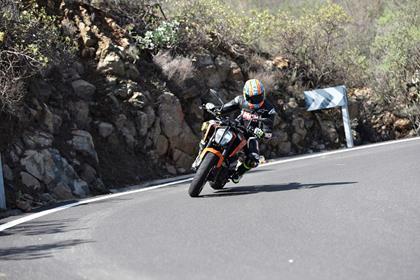 A canted forward riding, feet-back riding has a faint streak of wild supermoto about it. With little to no means of adjusting the forks and shock the suspension will always be a ‘one size fits all’ compromise. It’s on the firm side of push, but even if there were clickers to play with, the set-up is so bang-on for most road conditions and even the track, you probably won’t bother anyway, unless you were particularly heavy, or extremely fussy. 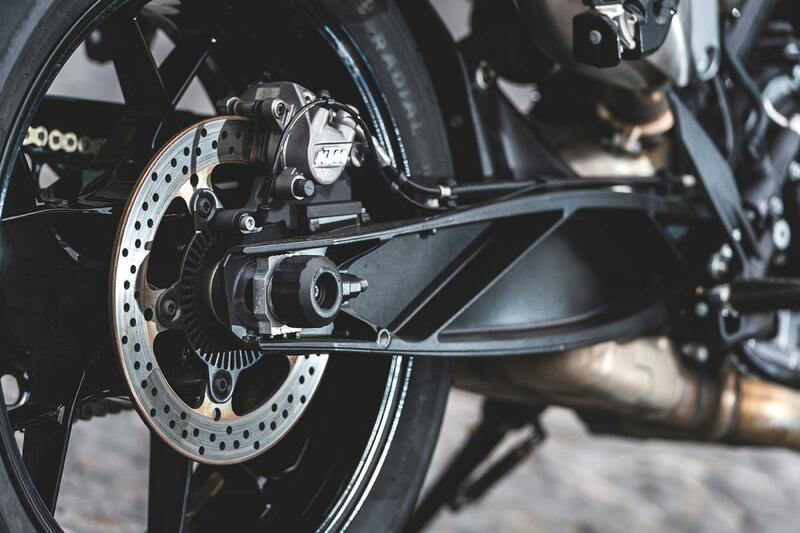 Cornering ABS lacks a little initial feel, as do most brake-by-wire systems nowadays, but the electronics never intrude unless absolutely needed. 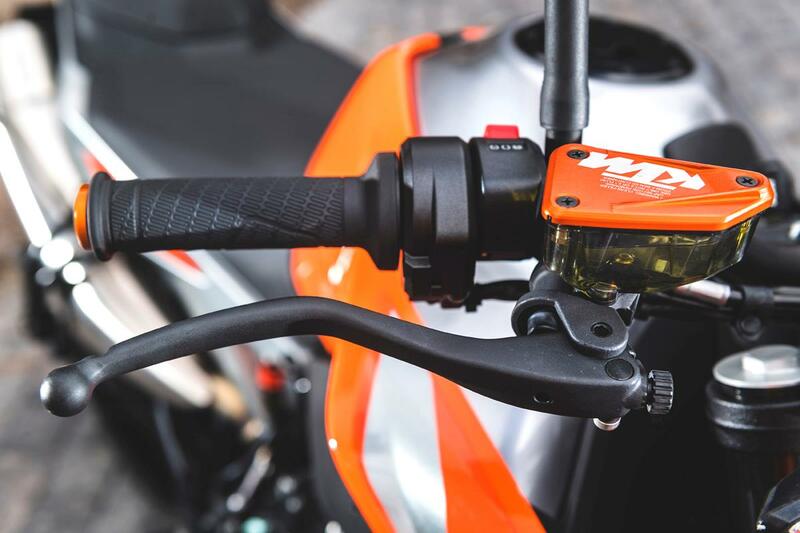 The slick autoblipper and quickshifter enhances an already sweet gearbox and you only need to use the light-action slip-assist clutch when you’re pulling away or stopping. 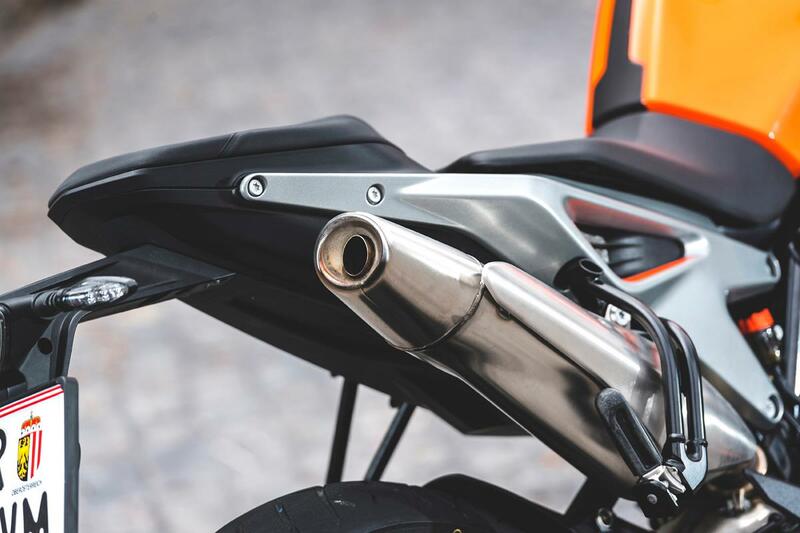 Happily the KTM is less ‘scalpel’ and more ‘butter knife’ when you just want a normal, predictable, motorcycle, for the times you’re just riding to work, or getting caught in the rain. It never strains at its orange leash, or tuts disappointingly when you’re not surgically dissecting pieces of tarmac. 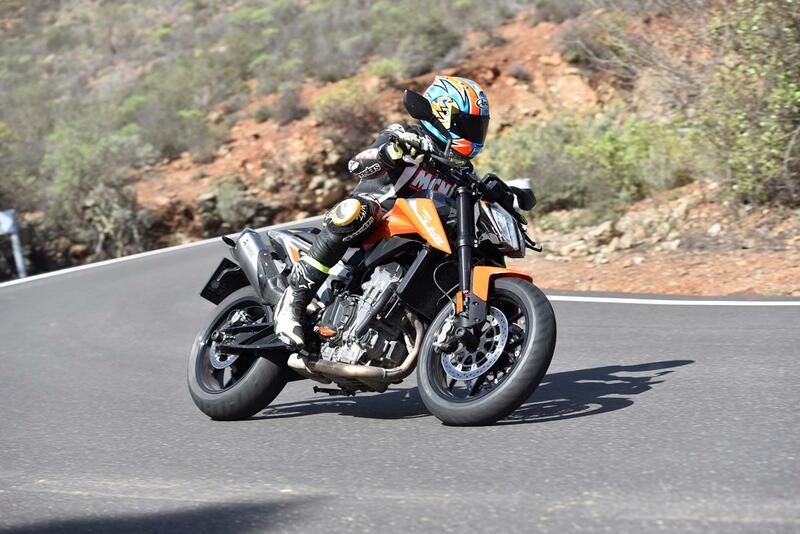 The 790 Duke is as calm, reassuring and easy as the best of the middleweight nakeds. A new 799cc LC8c (‘c’ for ‘compact’) motor is the Austrian firm’s first parallel twin. It’s pared to the bone and impossibly small. How such a tiny lump of metal, with bits whizzing around inside, can produce such grunt (64ftlb of torque) and free-revving power (105bhp) is astonishing. Crammed with forged this, lightweight that and DLC-coated the other, the racy, but refined motor looks no bigger than a single. Unlike a ploddy one-pot, the new engine is as refined and vibe-free as an inline four, but its 75-degree crank offset and 435-degree firing intervals give the twin an added dash of drama. A deep, gurgling V-twin-like growl accompanies you as you whip out of corners and surge through the revs. 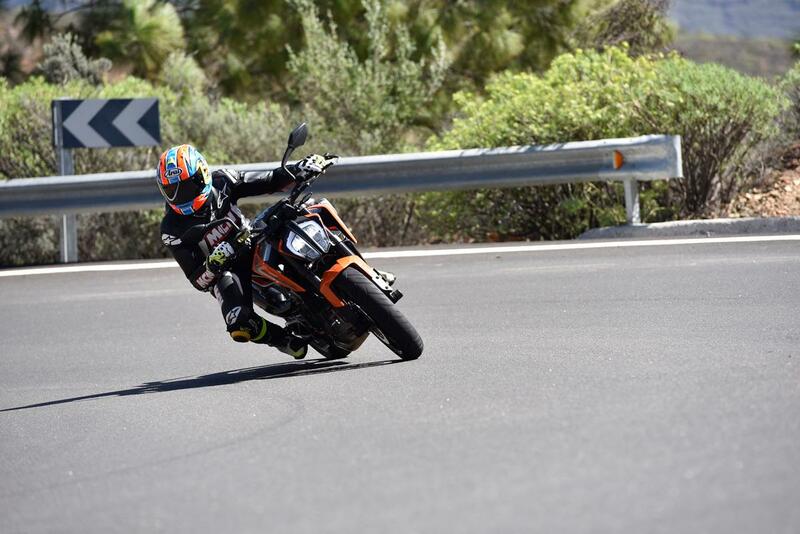 Off the throttle the KTM gurgles and spits like a race bike. 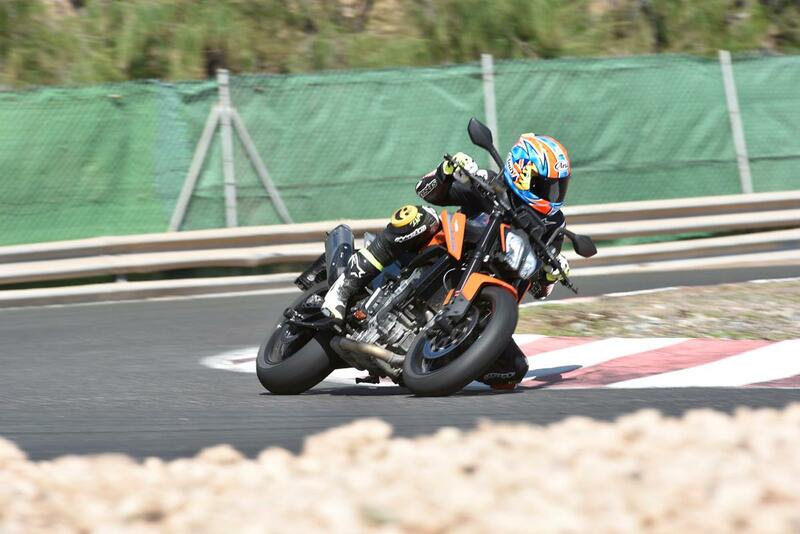 Even with its Euro4 exhaust the 790 Duke makes a wonderful, rhythmic din. 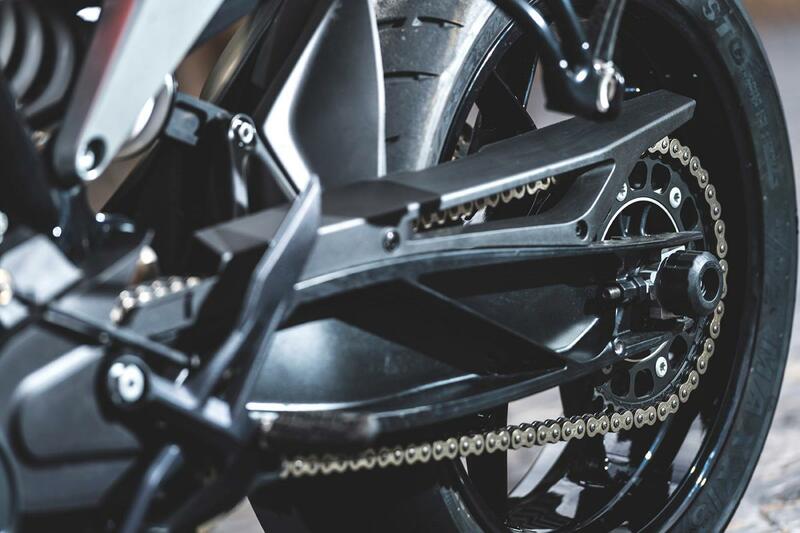 It’s too early to say how the 790 Duke will be years down the line, but its rolling chassis is made from tried and tested components and the motor has been subject to over half a million miles-worth of testing. 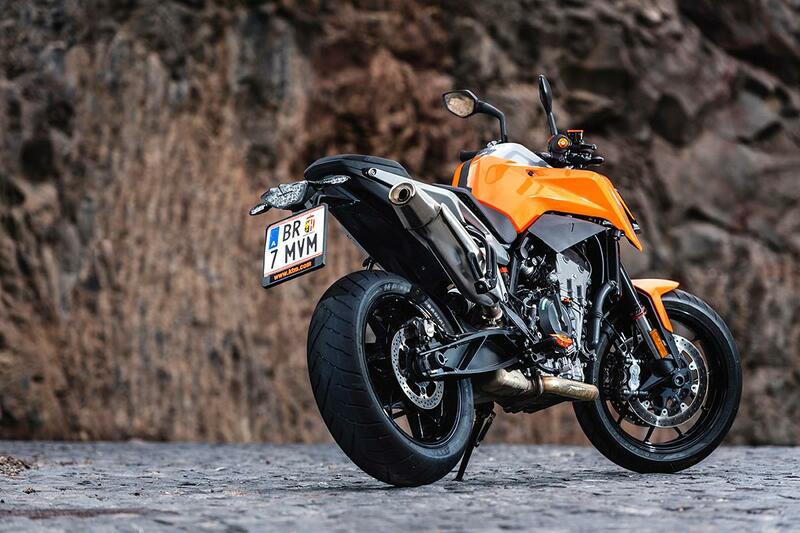 The 790 Duke is cheaper than the MT-09SP and a Street Triple R and pricier than the value-tastic MT-07, MT-09 and base-model Street Triple S, but KTM gives you an awful lot of bang for your buck. 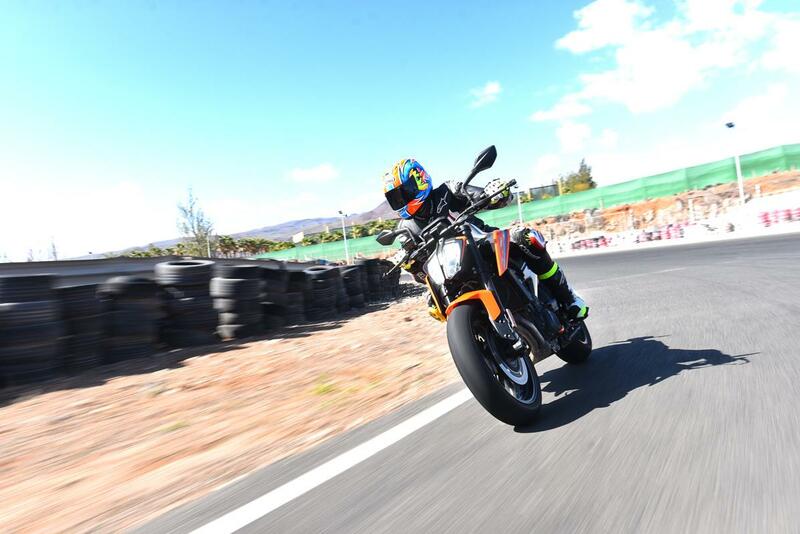 Standard equipment includes electronics not even standard on some Japanese superbikes, let alone middleweight nakeds: lean-sensitive ABS, traction and engine braking control, an up/down blipper and four riding modes (Sport, Street, Rain, Track). 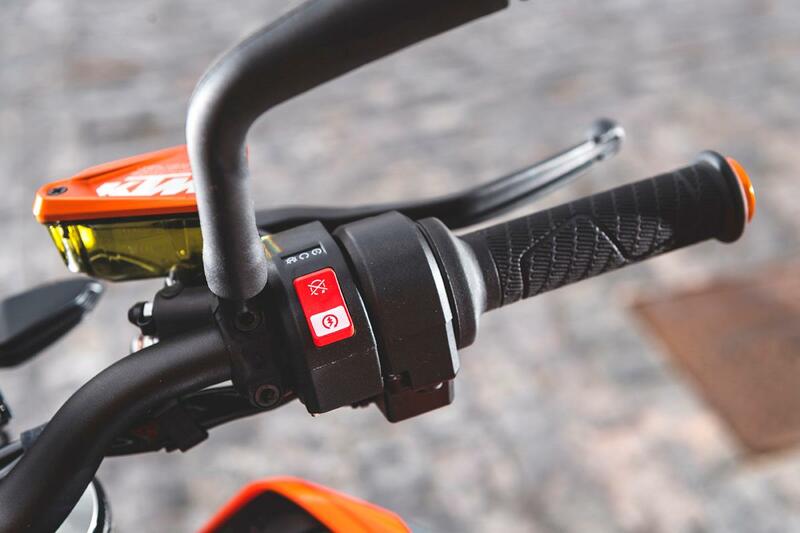 There’s also a colour TFT screen with blue tooth, WP suspension, a steering damper, LED lights, adjustable levers and handlebars and a steering damper. You also get a machine that’s the result of over half a million miles of testing, by 60 orange-shirted engineers and test riders, including former MotoGP legend Jeremy McWilliams. KTM are spoiling us. In other areas the 790 is built down to a price: WP forks are non-adjustable and you can only twiddle the shock preload. It has own-brand four-piston radial brake calipers (actually made by Spanish experts J.Juan – as seen on Rea and Syke’s WSB leathers) and Maxxis tyres. 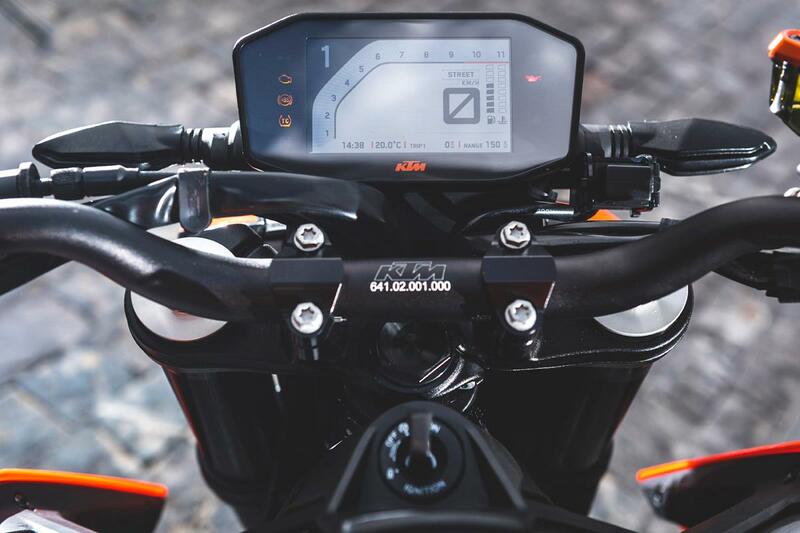 2018: 790 Duke launched, featuring KTM’s first parallel twin cylinder engine and a full suite of electronics. 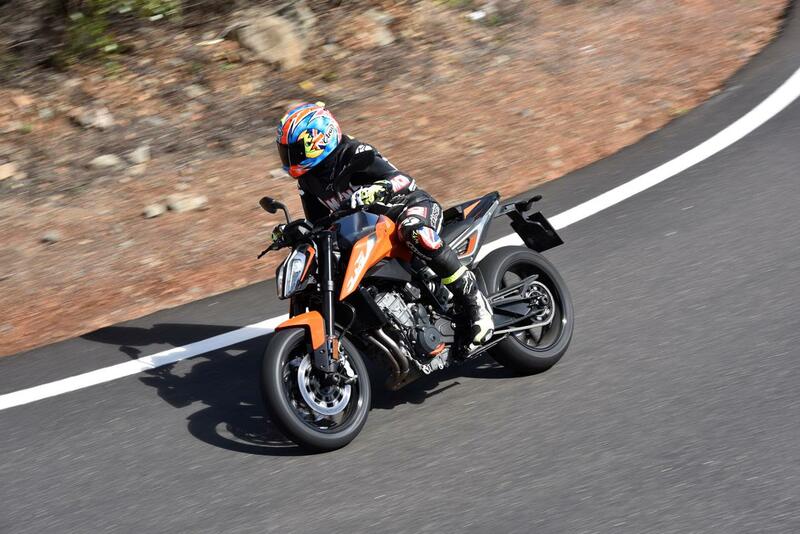 7 owners have reviewed their KTM 790 DUKE (2018-on) and rated it in a number of areas. Read what they have to say and what they like and dislike about the bike below.  Potentially brilliant bike let down by build quality. Brakes are good, but the unadjustable suspension is awful on our bumpy English roads, any small road imperfections cause the forks to crash and jar you hands. On smooth roads it’s fine though. 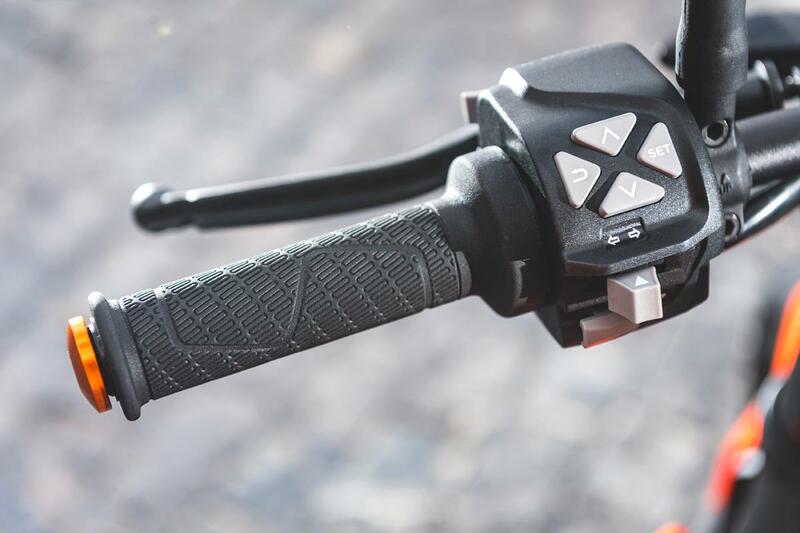 The best bit of the bike in performance terms is the lovely quick shifter/blipper. The bike is massively let down by three different oil leaks to date in under 700 miles. It’s sad but It may be the first and last KTM I purchase as it was also supplied brand new with lots of other cosmetic faults. Scratched tank, scratched subframe, damaged clutch lever, peeling graphics...........REALLY POOR. Not the cheapest first service. Great equipment as standard but a comfort seat really made a good addition. The KTM is a fantastic piece if kit and very good all rounder. It's a very easy bike to ride, a bit like a 125 that's beefed up. Very enjoyable and fantastic brakes. It has a lovely sounding engine and pulls very well throughout gears and rev range. I have 5700 miles on mine it now has its second oil leak as well as overheating issues because it goes through an entire reservoir of coolant in two days. My heads up display has had 11 cracks appear over night and I've had to replace the front sprocket as the first one fell apart plus a set of fork seals which were leaking when i picked the bike up. This would be a 5-star rating, but the Maxxis tyres that come on it are pants if there is any moisture and they don't hold any heat. Great fun all rounder ! Brakes initial bite is quite soft, but plenty of power and great feel. So far so good. Never had a KTM before. This is the best bike I have owned. Had numerous bikes but never been able to exploit their full potential on the road because I am mildly sensible. Not this one, I ride it like a twot and it’s so easy. Smile, smile, smile - the modern RD350 but si much more. The brakes work and I ride it without worrying about what setting it’s on because I’m having so much - FUN ! A modern classic,game changing,lovely bit of tech ! I have a 1999 R1 which I’m moth balling because the KTM is so good. Nothings fell off yet ! Quick shifter and auro blipper work really well, makes a BMW look agricultural. No idea what I’ll do with lean ABS and launch control but got to be worth a go ! Gear4ktm - Paul or Luke are the men. Paul - Waiting for my touring screen to do the Alps and beyond. I’ve down sized from the 1290 Super Duke by accident as was given a 790 demo bike while mine was serviced and loved the engine and gearbox from the off. It’s so much fun and I feel like I need to attack each corner and it never fails to put a big cheesy grin on my face. Not the most competent brakes and think it’s because I’ve been spoilt previously with Brembo set ups. I’ve had no problems as yet and only had it 2 months, 1000 miles. So far runs like a dream. I still find it drinks a lot but I tend to be in track and sport mode and riding like my hairs on fire so I put the bad fuel economy down to me. Has all the whistles and bells and I absolutely love it. What a bike! Does everything with ease, very confidence inspiring keeps up with any superbike round the twisties. Ride quality is superb, the engine is so sweet. No vibration at all. Brakes are sharp. Although it's got less power than my last bike, I love this engine, so much punch! Shame they didn't add like another 2-3 thousand rpms to the rev limit though because it feels so sweet, high revs it just runs out a bit quick. Couple of small issues, launch control doesn't work.. Paint gone funny on the body around the tank and coolant level keeps going down but currently being fixed under warranty. Parts are fairly expensive, fuel consumption is fantastic though. Only had first service which was about £90 just for parts. That's an expensive oil filter plus oil. The best parts of the bike are the handling (probably thanks to the super clever traction control and cornering ABS) and quickshifter up and down, the bike literally makes me look like a pro. The bike is really nice, unfortunately I would not recommend the bike due to the fact it developed an electrical fault within 6 hours of riding it away from the dealership. Bike rode nicely before it broke down. Had to have it recovered before i even got it home due to an electrical fault, I literally had the bike 6 hours. This obviously gives me great concern going forwards. Good overall value given the amount of tech on it. Bags of equipment, mirrors are crap but they are on most new bikes. Purchased from a dealer, new.